Just wanted to let you know we are very pleased with the results of your model # 4960. The unit works perfectly for our interior spray finishing department for fine art prints. When the need arises, we will certainly be purchasing another unit! I owned my Mobile Work Station for about three years. I LOVE IT… I paint fire trucks and this Mobile Work Station enhances the production of my larger booth. It keeps making me money in addition to saving me money. Just wanted to let you know how much we like the Mobile Work Station® we purchased from you. We are not in the automotive industry, but rather a manufacturer of pneumatic, hydraulic and electric controls and equipment. This product has been a great addition to our shop. The ease of use and mobility make it a winner!… To anyone considering purchase, I could not recommend it more. Thanks for putting such a great product on the market. This is a great tool and we would recommend it to any shop that is looking for a mobile work station! We operate a small paint repair business doing bumper & small panel painting using the Mobile Work Station®. I can’t tell you how much this piece of equipment has simplified our business. It works as advertised and is mobile to move to the front, back or side of the vehicle we are working on. Most importantly, it keeps our business in compliance with local codes and regulations. I would recommend your product to anyone who has the need for a quality product. I would like to convey to you my satisfaction with the Mobile Work Station® I purchased. It has done a terrific job in my body shop… This unit keeps my body shop clean and with no overspray. It reduces energy costs and runs on 110V power. I have used other units in the past. This unit is much more superior. It is more efficient and allows for a cleaner finish on the items we paint. Thank you for supplying my shop with this great product. I just wanted to say thank you for introducing the Shop Pro 5400. This mobile workstation is hands-down the best product to enter this industry in years. Money well spent for any repair facility to increase productivity and save time and MONEY! We wanted to let you know how happy we are with the Shop Pro Model 5410 that we purchased in January. It has exceeded all of our expectations. Our productivity has increased. Our quality has increased and most of all the safety for our employees has improved. I never thought a mobile unit working on a 110 volt system could have the air draw that this unit has. It is easy to move and a huge asset to us. We have found working with the Mobile Work Station® a great time saver in our shop. We especially like being able to jam the front end of a vehicle without having to take it off the frame machine. 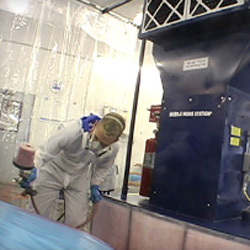 We find being able to spray pimer where needed without tying up the paint booth a big help to both body man and painter. I’m overwhelmed with the performance of the Mobile Work Station®. I wish I had purchased one 20 years ago… I honestly can say that this is the best piece of equipment that I have ever owned. In December 2006, we purchased a model 5420 Mobile Work Station® from you after seeing it demonstrated at NACE. After using it for a year, we are convinced it was exactly the right tool for the job. The filtering system consistently returns clean air with no odors and the air flow is more than adequate to dry the waterborne paints that we use. We could not be more pleased with this purchase. Thank you for a terrific product that works as well as advertised. Let us start by saying when we first looked at the Mobile Work Station® we thought the price was too high; we are a two man shop with limited space. We were so wrong!… The literature, pictures, and web site don’t show how well it’s designed and constructed, or how well it works! We looked at all our options before deciding to purchase a Mobile Work Station®. You had all the others beat by a mile and so we purchased our first unit in March of 1999. It increased our production immediately and paid for itself in less than six months. We subsequently purchased three more in the next few years and watched our sales increase Thank you for putting out a product that does exactly what you said it would. I just had to take time out from our busy day to let you know how happy we are with our Mobile Prep Station we recently purchased from you. We have gone from painting 3-4 cars a day to 6-7 cars, almost doubling the production of my spray booth. I can now do all my parts cut in, bumper jobs, and small spot painting in this prep station, leaving my paint booth open for all larger jobs. We purchased our Mobile Work Station® Model No. 4910 in October 2003, and I absolutely love the unit. We probably average six repair jobs a day with the Mobile Work Station®. We like it so much that we are planning to buy a Model No. 5410 for our other location. We purchased the Shop Pro Mobile Work Station® about a year ago. We have been very pleased with the outcome of the Mobile Work Station® at our main office; so pleased that we actually are thinking about purchasing another one. The Mobile Work Station® is a tremendous help with our painting needs, both in cost effectiveness and size. The Mobile Work Station® has been well worth our investment, the mobility of this unit really comes in handy when doing spot repairs and bumper refinishing, not to mention the time savings of not having to move things around just to get into the booth.